Layers of Earth's upper atmosphere. Asthe sun's energy rises and falls, so goes the Earth's atmosphere, a new studysuggests. Thesefluctuations in the sun's energy explain a recent partial collapseof the Earth's upper atmosphere, which had previously puzzled scientists. Asharp drop in the sun's ultraviolet radiation levels triggered the collapse,according to the new study, detailed in the Aug. 25 edition of the journalGeophysical Research Letters. The researchers also found that the sun'smagnetic cycle, which produces differing numbers of sunspots over anapproximately 11-year cycle, may vary more than previously thought. "Ourwork demonstrates that the solarcycle not only varies on the typical 11-year time scale, but also can varyfrom one solar minimum to another," said study team member Stanley Solomonof the National Center for Atmospheric Research (NCAR) in Boulder, Colo. "Allsolar minima are not equal." Thefindings may have implications for orbiting satellites, as well as for the InternationalSpace Station. "Withlower thermospheric density, our satellites will have a longer life in orbit,"said study team member Thomas Woods of the University of Colorado at Boulder. "Thisis good news for those satellites that are actually operating, but it is alsobad because of the thousands of non-operating objects remaining in space thatcould potentially have collisions with our working satellites." Recently,solaractivity was at an extreme low. In 2008 and 2009, sunspots were scarce,solar flares almost non-existent, and solar extreme ultraviolet light (EUV) ? aclass of photons with extremely short wavelengths ? was at a low ebb. Duringthis time, the Earth's thermosphere shrank more than at any time in the 43-yearera of space exploration. 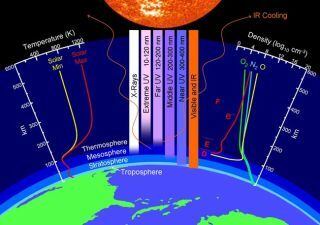 Thethermosphere, which ranges in altitude from about 55 to more than 300 miles (90-500km), is a rarified layer of gas at the edge of space where the Sun's radiationfirst makes contact with Earth's atmosphere. It typically cools and becomesless dense during low solar activity. Butthe magnitude of the density change during the recent solar minimum appeared tobe about 30 percent greater than would have been expected by low solaractivity. Researchersused computer models to analyze two possible culprits in the mystery of theshrinking thermosphere. Theysimulated both the impacts of the sun's output and the role of carbon dioxide,a potent greenhouse gas that, according to past estimates, is reducing thedensity of the outer atmosphere by about 2 percent to 5 percent per decade. However,scientists were uncertain whether the decline in extreme-ultraviolet radiationwould be sufficient to have such a dramatic impact on the thermosphere, evenwhen combined with the effects of carbon dioxide. Thecomputer models showed that the thermospherecooled in 2008 by 41 Kelvins (about 74 degrees Fahrenheit or 41 degreesCelsius) compared to 1996, with just 2 Kelvins attributable to the carbondioxide increase. Theresults also showed the thermosphere's density decreasing by 31 percent, withjust 3 percent attributable to carbon dioxide. The results closely approximatedthe 30 percent reduction in density indicated by previous work. "Itis now clear that the record low temperature and density were primarily causedby unusually low levels of solar radiation at the extreme-ultraviolet level,"Solomon said. Woodssays the research indicates that the Sun could be going through a period ofrelatively low activity, similar to periods in the early 19th and 20thcenturies. This could mean that solar output may remain at a low level for thenear future. "Ifit is indeed similar to certain patterns in the past, then we expect to havelow solar cycles for the next 10 to 30 years," Woods said.